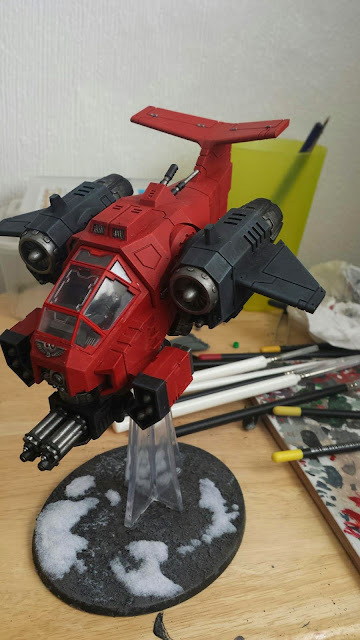 'I watched that Astartes bird fall from the sky like its wings had been clipped, dropping faster and faster. The thing I remember is the noise. There was none, just silence. About fifty metres from the deck, the damn thing kicked its thrusters in, dropped into a hover outside a rebel-held building, and just starts shredding everything moving inside. That's the thing about Astartes weaponry, it's the sound of death, pure and cleansing. It fired off four missiles into the remains of the structure, and before the explosions had even dissipated it was gone. Eleam Ilisdur, 38th Joturn Dragoons, Militarum Tempestus. Above can be seen the Crimson Shrikes Storm Talon 'Tangent Diagonal'. 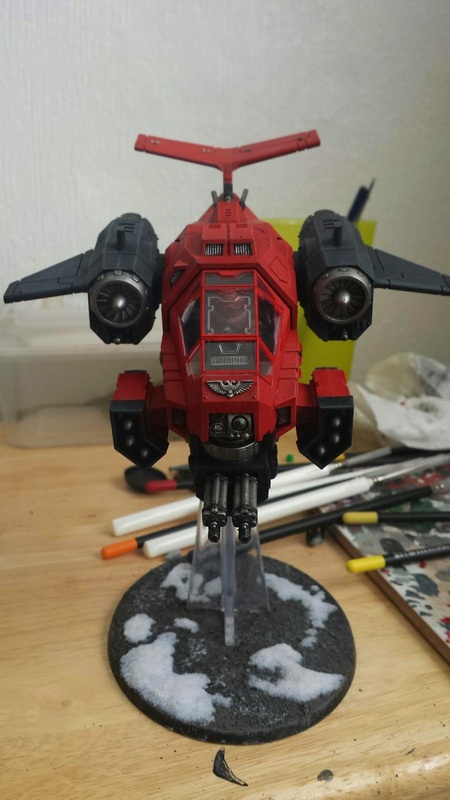 This Talon was piloted by Alekine Tobor of the IIIrd Company, and mostly deployed with its sister Talon 'Avalanche Rampant'. Tobor was a master of the famed combat technique, the Corvusfall, whereby a Shrike pilot will climb to cloud level or higher and cut all power. The Talon will drop, being manouvered to resemble a damaged or out of control craft until the fighter has nearly crashed, at which point the Astartes pilot will use the Talon's superior thruster tech to control the descent as close to base level as he dares, the Marine's enhanced biology keeping him conscious throughout the G-stresses involved. 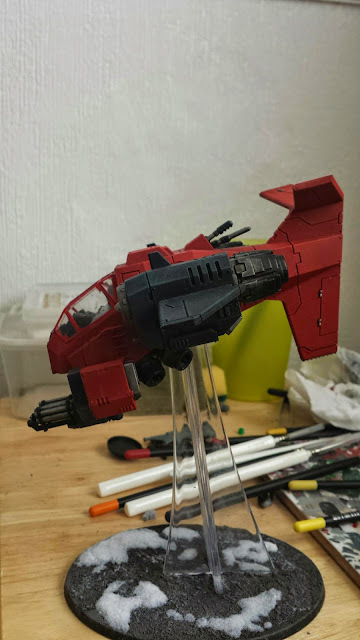 This provides the element of surprise which the Talon will use to strike at its target using Skyhammer missiles and assault cannon. After the attack, the Talon will boost back to combat ceiling to scout its next target. During the Shrine War, Alekine and 'Tangent Diagonal', in conjunction with 'Avalanche Rampant' were responsible for over 35 confirmed enemy heavy armour kills. After the destruction of 'Rampant', Alekine was tasked with enemy light armour and infantry disruption, the sound of howling afterburners being the last thing many rebels would hear.